ISTPs have a compelling drive to understand the way things work. They’re good at logical analysis, and like to use it on practical concerns. They typically have strong powers of reasoning, although they’re not interested in theories or concepts unless they can see a practical application. They like to take things apart and see the way they work. ISTPs have an adventuresome spirit. They are attracted to motorcycles, airplanes, sky diving, surfing, etc. They thrive on action, and are usually fearless. ISTPs are fiercely independent, needing to have the space to make their own decisions about their next step. They do not believe in or follow rules and regulations, as this would prohibit their ability to “do their own thing”. Their sense of adventure and desire for constant action makes ISTPs prone to becoming bored rather quickly. ISTPs are loyal to their causes and beliefs, and are firm believers that people should be treated with equity and fairness. Although they do not respect the rules of the “System”, they follow their own rules and guidelines for behavior faithfully. They will not take part in something which violates their personal laws. ISTPs are extremely loyal and faithful to their “brothers”. ISTPs avoid making judgments based on personal values – they feel that judgments and decisions should be made impartially, based on the fact. They are not naturally tuned in to how they are affecting others. They do not pay attention to their own feelings, and even distrust them and try to ignore them, because they have difficulty distinguishing between emotional reactions and value judgments. This may be a problem area for many ISTPs. An ISTP who is over-stressed may exhibit rash emotional outbursts of anger, or on the other extreme may be overwhelmed by emotions and feelings which they feel compelled to share with people (often inappropriately). An ISTP who is down on themself will foray into the world of value judgments – a place which is not natural for the ISTP – and judge themself by their inability to perform some task. They will then approach the task in a grim emotional state, expecting the worst. ISTPs are excellent in a crisis situations. They’re usually good athletes, and have very good hand-eye coordination. They are good at following through with a project, and tying up loose ends. They usually don’t have much trouble with school, because they are introverts who can think logically. They are usually patient individuals, although they may be prone to occasional emotional outbursts due to their inattention to their own feelings. As an ISFJ, your primary mode of living is focused internally, where you takes things in via your five senses in a literal, concrete fashion. Your secondary mode is external, where you deal with things according to how you feel about them, or how they fit into your personal value system. ISFJs live in a world that is concrete and kind. They are truly warm and kind-hearted, and want to believe the best of people. They value harmony and cooperation, and are likely to be very sensitive to other people’s feelings. People value the ISFJ for their consideration and awareness, and their ability to bring out the best in others by their firm desire to believe the best. ISFJs have a rich inner world that is not usually obvious to observers. They constantly take in information about people and situations that is personally important to them, and store it away. 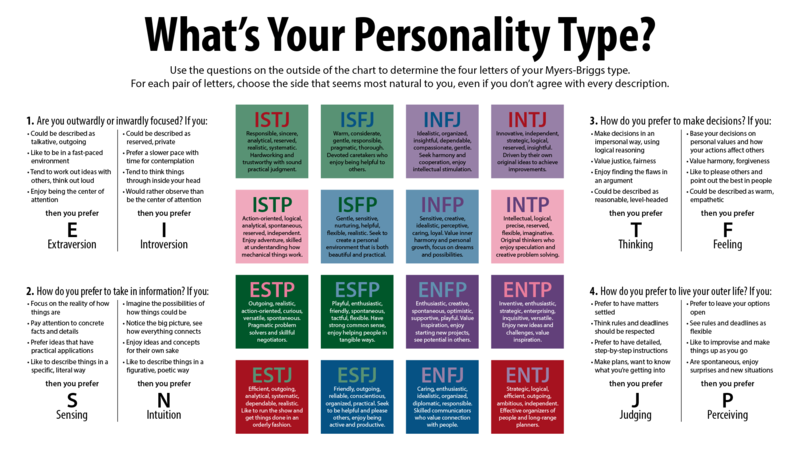 This tremendous store of information is usually startlingly accurate, because the ISFJ has an exceptional memory about things that are important to their value systems. It would not be uncommon for the ISFJ to remember a particular facial expression or conversation in precise detail years after the event occured, if the situation made an impression on the ISFJ. ISFJs have a very clear idea of the way things should be, which they strive to attain. They value security and kindness, and respect traditions and laws. They tend to believe that existing systems are there because they work. Therefore, they’re not likely to buy into doing things in a new way, unless they’re shown in a concrete way why its better than the established method. ISFJs learn best by doing, rather than by reading about something in a book, or applying theory. For this reason, they are not likely to be found in fields which require a lot of conceptual analysis or theory. They value practical application. Traditional methods of higher education, which require a lot of theorizing and abstraction, are likely to be a chore for the ISFJ. The ISFJ learns a task best by being shown its practical application. Once the task is learned, and its practical importance is understood, the ISFJ will faithfully and tirelessly carry through the task to completion. The ISFJ is extremely dependable. The ISFJ has an extremely well-developed sense of space, function, and aesthetic appeal. For that reason, they’re likely to have beautifully furnished, functional homes. They make extremely good interior decorators. This special ability, combined with their sensitivity to other’s feelings and desires, makes them very likely to be great gift-givers – finding the right gift which will be truly appreciated by the recipient. More so than other types, ISFJs are extremely aware of their own internal feelings, as well as other people’s feelings. They do not usually express their own feelings, keeping things inside. If they are negative feelings, they may build up inside the ISFJ until they turn into firm judgments against individuals which are difficult to unseed, once set. Many ISFJs learn to express themselves, and find outlets for their powerful emotions. ISFJs need positive feedback from others. In the absence of positive feedback, or in the face of criticism, the ISFJ gets discouraged, and may even become depressed. When down on themselves or under great stress, the ISFJ begins to imagine all of the things that might go critically wrong in their life. They have strong feelings of inadequacy, and become convinced that “everything is all wrong”, or “I can’t do anything right”. The ISFJ is warm, generous, and dependable. They have many special gifts to offer, in their sensitivity to others, and their strong ability to keep things running smoothly. They need to remember to not be overly critical of themselves, and to give themselves some of the warmth and love which they freely dispense to others.